Amygdaloidal basalt is almost invariably carved into plain bottles without surface decoration, for obvious reasons. It is a fascinating material in its own right, but the characteristic irregular strands of inclusions, of varying degrees of hardness, may have inhibited the lapidary from attempting any complicated relief carving. 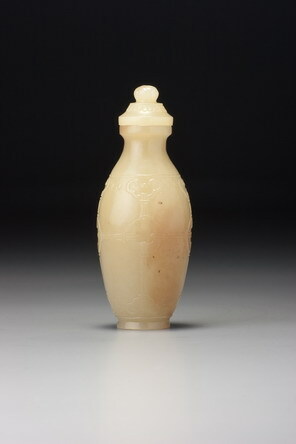 For the snuff-bottle material the ground is invariably black and is made up of what is known as volcanic glass, or obsidian, the result of molten lava released through the volcano and cooling rapidly, causing the various chemical elements in the molten material to solidify into an amorphous mass. Sometimes this material is riddled with gas-bubbles from the eruption, leaving the obsidian full of gaps which over time fill with other minerals, which may be quartz, epidote or calcite, giving the stone its distinctive appearance. This volcanic material constitutes a third type of puddingstone for the snuff-bottle collector, the other two being the hard, quartz variety of Treasury 2, no. 212, and the limestone conglomerate of Sale 2, lot 35. This third material has now become sufficiently well known as amygdaloidal basalt that the term volcanic puddingstone is disappearing. For three other examples of this material with a diverse range of colouring and markings, see White, 1990, Pl. 53, nos. 1–3 and for another, displayed with two snuff dishes of the same material, see Stevens 1976, p. 17, fig. 2. 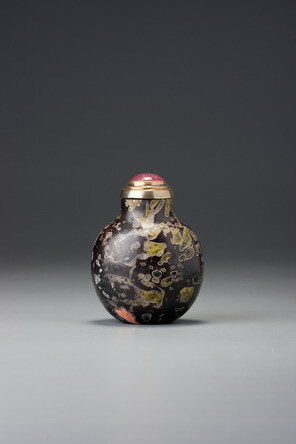 An unusual variant with predominantly pink inclusions is illustrated in Hall 1989, no. 29 and another is in the J & J Collection,Moss, Graham, and Tsang 1993, no. 75. This is one of the most striking examples of the material, not because the stone is any different from the usual range, with the exception of some small inclusions of pink material, but because it is of such a lovely form. It is an ideal compressed sphere, beautifully achieved, with perfect formal integrity and fine detailing, including the hollowing, which is excellent. It is also unusually small for an amygdaloidal basalt. The Beasley Collection was largely formed by Marguerite Alwyn (‘Mac’) Beasley’s father, Harry Geoffrey Beasley (1881 – 1939). He was one of the pioneering Orientalist collectors in England with an interest that embraced both Chinese and Japanese works of art. Mac inherited the collection and delighted in it for most of her life, sharing it joyously and gaining many loyal friends among other collectors. She added very little to the collection herself.